Alice seems pleased with her new polished stone implement. A day of fantastic finds! Today has seen the most fantastic finds emerge from the soils and midden of the Ness. Not that this is in any way unusual – every year the finds hut echoes to “oohs” and “aaahs” as the latest beautiful artefact is brought in with the finds trays. You will have to wait for a few paragraphs until we get to the new finds, though, for Sarah has been smiling – even more widely than usual – thanks to a surprising discovery in Structure Ten. Sarah, to remind you, has been toiling (and “toil” is the word) through the floor deposits of Structure Ten. They seem to be neverending but Jo (see below) came to her rescue today by digging a sondage (small, defined hole) in the floor of the structure, to one side of the massive hearth. What was revealed, some ten centimetres down, is a handsome, and level, clay floor, which can only be, at long last, the primary floor of the structure. Now, those who have dug laboriously through ten centimetres of floor will know that this is usually a lengthy process – for the simple reason that ten centimetres can contain numerous contexts, each one of which has to be dug individually, and carefully, and then recorded. To Sarah’s delight, this ten centimetres appears to be just one context, which means it can be dealt with quickly. In other words, the end is in sight (or at least the beginning of the end! ), at least of the Structure Ten floors. Now we can move on to the finds. 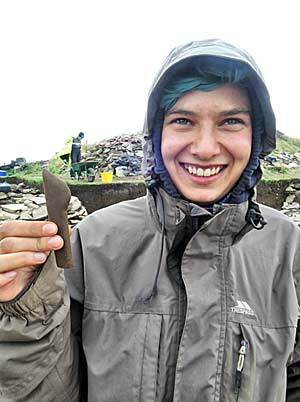 In the central midden area, Alice has found a beautiful stone tool in almost pristine condition. To describe it is difficult, but Martha’s suggestion that it reminded her of a harpoon is one of the best so far. It is also uncannily like some of the modern wooden tools available in art shops for clay modelling. 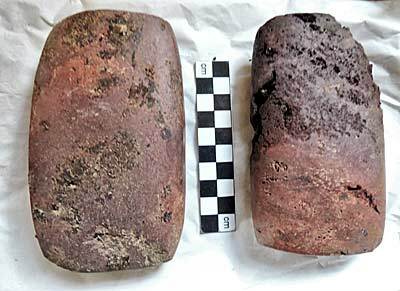 So, for the moment, it joins our stone spatulas from Structure Eight as possibly a potter’s tool. The two polished stone “pillows” are reunited for the camera. You may recall from Monday’s diary the once handsome, but now sadly decayed, “pillow” stone, which appears to have suffered from some form of lithic leprosy. Tom Muir brought its almost identical twin out to site yesterday from the Orkney Museum, where it has been part of a small Ness exhibition. The two are remarkably similar and seem to have suffered from the same unfortunate ailment, perhaps caused by the effect of water immersion on sandstone. Their beauty, however faded, is still intact. Meanwhile, in tiny Structure Eleven, Mac was removing the last remnants of a possible wall line behind the hearth when he uncovered, and turned over, a large stone. 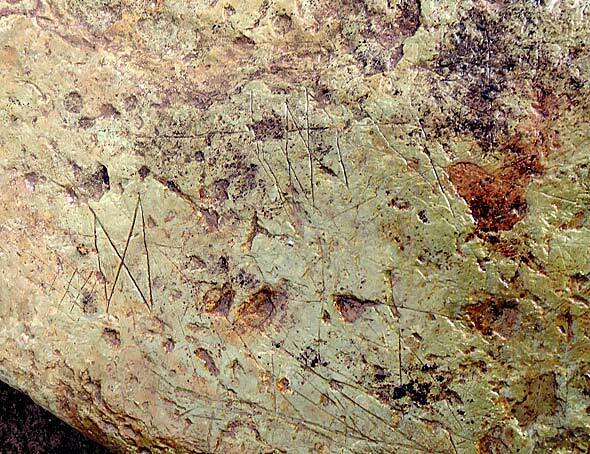 It’s lower surface turned out to be covered with fine, incised decoration, ranging from more examples of the “Brodgar Butterfly” to an array of multiple chevrons, conjoined rhombuses and an exquisite little checkerboard. It is another wonderful addition to the tally of decorated stone from the Ness, which now numbers more than 600 examples. Look carefully to see the intricate designs on this new decorated stone from Structure Eleven. 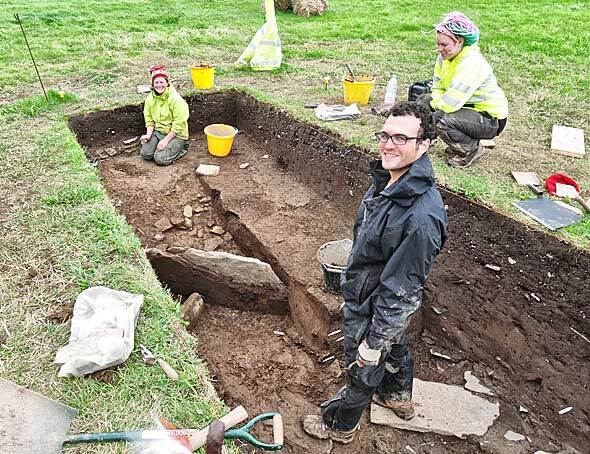 We move now to the area around the central standing stone, where Owain and his team of Chris, Jenny and Alison have been removing rubble and assessing clay surfaces. They now have a flagged surface, which appears to surround the standing stone, perhaps creating a handsome exterior to the primary exit from adjacent Structure One. Just a little further to the south-east, Chris, while clearing the base of the Structure Twelve wall exterior, discovered yet another proto-pillow stone, this time in a striking banded and polished stone. Professor Scott Pike cores down into the depths of the monumental midden mound. In Trench T, Professor Scott Pike has been taking cores through the middle of the mound, high up and adjacent to the “Crack of Doom”. He has discovered that the mound is at least three metres deep at this point but that half-way down there is a 20 centimetre-thick layer of clay. This may be similar to the clay caps which are often found sealing the top of Neolithic structures. We may yet find something very exciting at the centre of this mound. Just as exciting, at the bottom of the long trench down the side of the mound, an orthostat, which appeared recently, has now resolved itself into what looks very like the stump of a massive standing stone. There is even a chocking stone visible, which may have been inserted at its base when erect to wedge it in place. A fantastic day at the Ness is now ending. We’ll all be back tomorrow. Jo and Graham reveal the standing stone stump at the bottom of Trench T.
Hi, I’m Jo McKenzie and if you’ve been following the diary for the last couple of days you’ll know that I’m currently annoying the good folk of Structures One, Ten and Fourteen – leaving gaping holes in their floor surfaces and cruelly cutting chunks out of their lovely hearths – all in the name of soil micromorphology. I’m an Honorary Research Fellow at Bradford’s Division of Archaeological Sciences, although currently based in South Wales, and as near to the sea as Ness is to the loch. I’m a geoarchaeologist, which means I use a range of archaeological science techniques to look at archaeological soils and sediments. On the Ness, my focus is soil micromorphology. Small blocks of undisturbed material are carefully collected so that the structure of the archaeology is preserved. From these, a microscope slide showing a complete “slice” through the sampled deposits can be made. Small bulk samples collected alongside the tin or block of soil provide material for complementary analyses such as organic matter content, magnetic susceptibility or phosphates, which can often help characterise what we think the soil ‘thin section’ tells us under the microscope. Soil micromorphology is a powerful technique in archaeology, and it’s particularly useful in understanding areas associated with intensive use, such as hearths or floor surfaces. Firstly, it allows us to see features too small to be clearly identified, or sometimes seen at all on site. 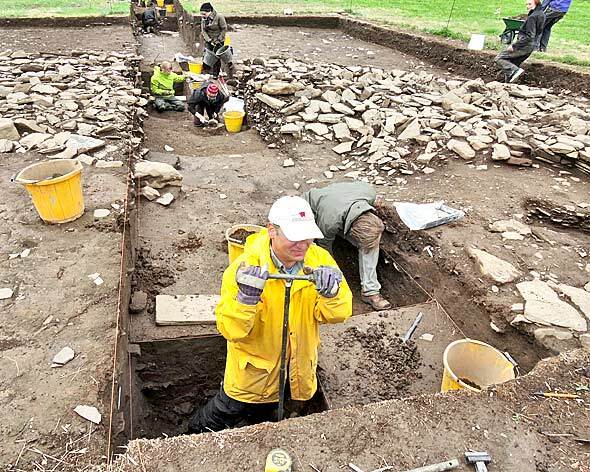 Did the people of Ness use peat, wood, or maybe turf for their fires? How hot did these fires get? Can we identify domestic or industrial activities? What materials make up the different floor surfaces within the buildings? Can we match similar floor ‘types’ across the site, and within different buildings? Can the mineralogy of these surfaces tell us anything about where their materials came from? What microscopic environmental features were trampled into that surface and what can they tell us about its use? Secondly, because it uses undisturbed samples, micromorphology allows us to see the exact position of microscopic features within a deposit, and this can give us a really detailed picture of activity as well as identifying archaeological events that can’t be seen with the naked eye. In Structure One, for example, a network of samples have been taken from different points across the layer upon layer of surfaces we can see – near the hearth, within the cells and entrances, along the main “heavy footfall” areas of the structure. Will the different surfaces show varying microscopic features depending on their location, and more intensive sequences of deposition and trampling? If so, this will help build an even more detailed picture of how Structure One was used and how this changed over time. I only have this week at the Ness, so it’s a frantic few days of sampling, with only the occasional chance to catch up with all that’s been discovered since last year, and with friends, old and new, collected through many years of digging and sampling in the Northern Isles. Sadly, my visit this year won’t coincide with that of fellow micromorphologist Lisa-Marie Shillito, whose Ness research is currently focusing on the midden deposits and the very exciting Trench T sequence – good luck for next week Lisa! Meanwhile, I’ll be heading south with an exciting cargo of bags and tins of soil and will look forward to seeing you all next year.